The FDA recently approved the Prevnar 13 vaccine against Streptococcus pneumoniae for adults. Previously, only the Pneumovax 23 vaccine was approved for adult use. I’m asplenic, since I had my spleen removed after a bike crash in 2000, and so am in a high-risk class for pneumonia caused by S. pneumoniae. I’ve already had vaccination with Pneumovax 23, so is there any point to getting Prevnar 13 as well? whether serotype 6A is common enough in adults to pose a risk to me. Prevnar 13 did produce larger effects than Pneumovax 23 for the strains they have in common, so it probably does confer some extra protection. [Vaccines and Related Biological Products Advisory Committee November 16, 2011 FDA Briefing Document] Also, doing Prevnar 13 followed a few years later by Pneumovax 23 had stronger effects than Pneumovax 23 alone, so they do seem to combine. In one study that compared Pneumovax 23 and Prevnar 13, in patients who had had Pneumovax 23 at least 5 years earlier, Prevnar 13 showed 1 to 3 times as much effect on the serotypes in common, and 9.6 times as much effect on serotype 6A. Experiments have been done to see whether Pneumovax 23 is protective against serotype 6A. For example, Lee et al. The effect of age on the response to the pneumococcal polysaccharide vaccine BMC Infectious Diseases 2010, 10:60 showed Pneumovax 23 working about as well against 6A as against the serotypes 4 and 19A, which are included in the vaccine. The assumption has been that including 6B provided enough cross-reaction that 6A was also covered. This seems to be reasonably true, at least for adults, and so the inclusion of 6A in Prevnar 13 would not be sufficient reason to get the vaccine, given that I’ve had Pneumovax 23 fairly recently. But I’ve already had 2 doses of Pneumovax 23 and “because data are not sufficient concerning the safety of 23vPS when administered ≥ 3 times, revaccination after a 2nd dose is not routinely recommended,” so the next time I get a pneumococcal vaccine it should probably be Prevnar 13. There does not seem to be any urgent need to do so, and I should probably wait for another decade or so, and then get Prevnar 13 (or whatever has replaced it by then) to bring my immune defenses back up. 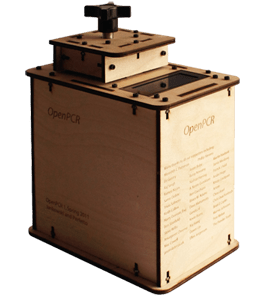 One of our grad students just pointed me to the OpenPCR project at OpenPCR – the $599 Thermal Cycler / PCR Machine. The machine is a thermal cycler that is controlled via a USB cable from a computer (PC or Mac, probably Linux as well, if you can figure out how to modify the code to talk to the USB port on your version of Linux). It comes as a kit that you assemble yourself (from laser-cut wooden parts, which are probably not very sturdy, but give a nice homebrew feel to the machine. You’d have to add some brass gears if you want a steampunk look. From a quick look at the information on the Downloads site, it seems that the machine has an Arduino as the controller, with an H-bridge (to power a Peltier-junction heater/cooler) and a high-resolution analog-to-digital converter (to read the block temperature). The lid also has a heater and a temperature sensor, but no cooler. The lid heater is controlled by the Arduino with a simple MOS transistor, and the temperature sensor is read directly by the Arduino—high precision is not as important for the lid as for the block. There is a big heat sink and a fan for the back side of the Peltier junction—they take up most of the room in the box. They provide detailed assembly instructions for download that have not been properly compressed—it’s a 109-Mbyte file that takes forever to download from their slow site, with pictures that seem designed for book-quality printing. It would have been nice for them to provide lower-resolution pictures in under 20Mbytes as an option, or even HTML instructions that could be viewed a page at a time without needing to download everything. The machine holds 16 200-microliter tubes, but does not appear to come with any, nor with any reagents. There also do not seem to be any use instructions—once you’ve verified that the thermal cycler is working, you seem to be on your own for figuring out how to use it. I assume that the OpenPCR people expect the forum to handle questions like that (or they are hardware hackers who can’t be bothered to deal with messy wet protocols), but there are no useful messages on the forums yet. The best sources for PCR protocols seem to be from the vendors of the polymerase and other reagents. Googling “PCR protocol” finds several such sources. I have no intention of getting a PCR machine myself (my eye-sight, hand-eye coordination, and patience with boring tasks are all too poor for me to do wet-lab work), but this looks like a good option for high school labs. In my post Numbers vs. symbols, I summarized and critiqued the preprint How numbers help students solve physics problems, by Eugene Torigoe. In this post I’ll look at three published papers by Torigoe, from his site https://sites.google.com/site/etorigoe/research. Because there were only 2 paired questions, it was not possible in this study to analyze the reasons for difference in performance, though Torigoe mentions several possibilities. This study is a followup on the previous one, now with 10 paired questions and 765 students. Unfortunately, the same flawed protocol of making one version of the test all symbolic and the other all numeric seems to have been followed. The unfairness to the students is larger this time (since the numeric questions are already believed to be easier). With 10 questions, it was possible to exam in more detail what sort of mathematical question caused the biggest difficulty. Torigoe also did a more detailed analysis of who was having difficulty with the symbolic versions. It turns out that the top of the class was having little extra difficulty with the symbolic questions—there was a slight drop in performance, particularly on the hardest question, but not really a significant one. At the bottom of the class, the difference in performance was enormous, with the numeric questions being very much easier than the symbolic ones. Torigoe chose to eliminate the two hardest questions from further analysis. One question 8, there was no difference between performance on symbolic and numeric versions, and the class as a whole was doing only a little better than guessing, so data from this question was unlikely to be meaningful about anything other guessing strategies. Question 5, however, had the strongest numeric/symbolic effect, and it is not at all clear why this question was excluded from the study. The performance on Question 5 was completely consistent with the subsequent analysis of the non-excluded questions (that is, it had all the characteristics of the other questions that showed a strong difference in performance), so it wasn’t a matter of excluding an outlier that did not support the hypothesis. Perhaps Torigoe was just trying to be fair—after excluding the hardest problem (which did not match his hypothesis) he excluded the second hardest (even though it did match his hypothesis). His after-the-fact analysis of the data suggests that the crucial factor is whether a problem involves manipulating a generic equation, which requires students to assign object-specific variables and apply a generic equation appropriately. Students at the bottom of the class often manipulate the equation blindly, without realizing that they have assigned the wrong meaning (average velocity instead of final velocity, for example). This paper is a more detailed analysis of the same data as in the 2007 paper. (Why did it take 4 more years to be done?) Torigoe recognized that the 2007 paper was a post hoc analysis and the hypotheses developed there had not been independently confirmed. In this study, he took a couple of the hypotheses and tried to confirm them on an independent data set. He did not generate new tests, but coded questions on older tests according to his classification scheme, and tried to see whether they were discriminating questions. That is, he was looking at structural properties of the math needed for a question to predict whether the question was easy for the top of the class and hard for the bottom of the class. He was mainly interested in distinguishing the bottom 1/4 from the rest, which implies to me that he is an educator of the NCLB type, more interested in getting everyone to a minimal pass level than in pushing the top end up. Of course, since the phenomenon he was studying (difficulty in symbolic manipulation) was not measurable in the top quarter of the class, this was a sensible, pragmatic choice for the data he had. single-equation numeric questions where the target unknown appears on opposite sides of the equal sign. He found that the equation-priority questions were more discriminating than other questions of comparable difficulty (comparable difficulty for the top ¾ of the class, that is). The questions he identified turned out to be among the hardest questions, so comparable difficulty questions were determined in two ways: eliminating easy questions until the remaining questions had the same average score as the equation-priority questions, or matching questions individually by difficulty. It didn’t make any difference which method was used. The correlation between performance on equation-priority questions was not huge (Pearson’s r 0.38, though it isn’t clear from the paper whether that is correlation with total score for the class or just with a bottom-¼/top-¾ indiator variable), but is much bigger than the correlation from other questions of comparable difficulty (Pearson’s r 0.29). The equation-priority questions were significantly enriched for highly discriminating questions (ones that had a correlation with class performance higher than 0.4). The preprint I discussed earlier is using fifteen of the students in same Spring 2007 class used for the previous 2 papers. These papers look like an attempt to get as many publications as possible out of a single study in a PhD thesis. Personally, I would have preferred to see new tests devised specifically to address the questions raised, rather than going back to mine the same 10 problems over and over. I think that this data set has now been over-analyzed, and any conclusions drawn from it really need independent confirmation with a new data set. The 2011 paper using the 2006 exams addressed the problem partially, but was not able to test many of Torigoe’s hypotheses, because there were not paired versions of the tests with the differences being just the points in question. Bottom line: Torigoe may have identified some structural characteristics of problems that give the bottom ¼ of large, introductory, calculus-based physics classes particular difficulty. More and better experiments are needed to see whether his analysis captures the phenomenon correctly or is the result of some confounding variable. Most of his analysis is of no relevance for the top ¼ of the class, where the future physics and engineering majors should be concentrated. I biked down to the Farmers’ Market this afternoon (something I’ve not done in a while, as my wife usually gets the groceries from the Farmers’ Market). Because it was the week between Xmas and the new year, many of the usual vendors were missing. There were still quite a few around, though. For the most part, what was being sold were winter crops: citrus, kiwi, potatoes, broccoli, Brussel sprouts, cauliflower. There were still some peppers and celery. What amazed me, though was that Swanton Berry Farm was still harvesting organic strawberries. I can’t remember a previous year in which good local strawberries were available into December, much less in the last week of the year. I think that we can thank a warm, dry December for the continued strawberries—usually the berries start rotting after a couple of heavy rains. I bought kiwi, oranges, and strawberries for fruit salad, potatoes for roasting (Pinnacle had some lovely little red potatoes), red peppers to put in scrambled eggs, and orange and purple heads of cauliflower, just because they were so pretty. I also bought some Satsuma tangerines, because I love Satsumas and the season will probably be over soon. The bakers who are normally at the Farmers’ Market were not there this week, so I had to go to a grocery store for bread from a different local bakery. Had I known that they would not be there, I would have gone to a bakery in the morning, and gotten fresher unsliced bread (the grocery store has yesterday’s bread, sliced and in plastic bags). On my way to the Farmers’ Market I broke my shifter cable for my rear derailleur, leaving me stuck in a high gear. That caused no problem getting to the market or riding around downtown, but hauling the groceries up the hill to get home did require me to dismount and walk my bike for a block. I took the bike into Sprockets, the neighborhood bike shop where I do most of my bike shopping, and left it for cable replacement and a general tune-up. I could replace the cable myself, as I usually do, but I’ve been planning to have a full tune-up done since last summer, and I’ll never get around to it if I try to do it myself. Breaking the cable gave me the excuse I needed to have a professional tune up the bike. Dropping of the bike means that I’ll be without my recumbent for a week, and will have to dust off a 25-year-old upright from my garage and see if the tires can hold air any more. I’ll also have to see if I can still ride an upright—the last time I had to do that was a couple of years ago, and it felt really weird. Greg Jacobs, in his post Just the basics, not the sources, of electric, magnetic fields, suggests that when teaching about electrical and magnetic fields, it is best to teach the effect of a uniform field on particle before teaching how the field is created. He supports this with his claim that gravitational attraction is best taught with before teaching . Matter and Interactions does this, with the first equation on page 66 in Chapter 2, and the second on page 96 in Chapter 3. I won’t be doing electrostatics or electromagnetics this year (we’re only aiming to finish the Mechanics part of Matter and Interactions), so I thought I’d leave myself a note here in the blog, so that I can revisit this question next year, when it matters. Oops, that’s not quite true. We already had back in Chapter 3, so it looks like M&I does precisely what Greg Jacobs was objecting to: introducing the creation of the field prior to talking about the effect of the field on a particle. Since we’ve already crossed that bridge, I don’t think there is much point to back-tracking. Especially since the energy chapters will be looking at potential energy in fields (gravitational or electrical). Next year, when we finally get to Chapter 14, Electric Fields, we’ll be starting with the key concept “A charged particle makes an electric field at every point in space (except its own location),” so there won’t be any opportunity to look at the effect of fields on a particle without looking at how the field is formed. Perhaps I’ll need to look for opportunities this year to present a simplified view.